Ciao lovelies! In today's Blogger Wednesday I'll be talking about Red Sakura Beauty! 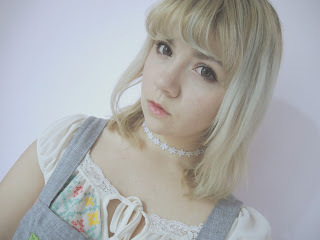 Sakura is a beauty blogger who does reviews, OOTDS, talks about J-fashion and much more! "I really like cherry blossoms, and since I originally wanted my blog to be a beauty blog, I was going to name it "Sakura Beauty". However, that was taken, so I decided to go with Red Sakura Beauty because red was my hair color at the time~ "
"I discovered blogging through reading other blogs- it seemed like a fun thing to take up as a hobby!" "I definitely love taking photos for my posts the most~ "
"My blog is mostly a beauty/fashion blog. I do a lot of circle lens reviews because I really like circle lenses- I think they contribute a lot to one's look, and they can change up a makeup look considerably." "I suppose various J-fashions inspire me- I like writing about the different makeup trends and fashion trends that I encounter. " "Although I don't include them all that often, I enjoy posting outfits~ I enjoy dressing up and taking photos of my outfits, so it's fun to have a platform to share them on ^_^ "
" Just write about what you're passionate about! It's difficult to write on a topic that you're not too exited about- just focus on something you like and the words will come easily." " I'd say my blog is an alternative beauty/fashion blog~"
"Although I use Blogspot/Blogger for my actual blog posts, I'm much more active on my Instagram (@milkiiprincess) ;u; "
I hope you all enjoyed learning about Sakura and her lovely blog! Be sure to check it out!